I come from a great line of planners. My whole family likes nothing better than getting our calendars out and planning family dinners and celebrations and adventures and vacations months in advance. On family vacations as a collective we want to seize the day and visit every place we can. My Dad builds us spreadsheets and emails them out in advance so we all have the breakdown of what is going on when. I admit it, I love it! I get a little thrill researching and planning and writing it down. My husband does not get the same jolt of dopamine as I do when he sees a full calendar and a spreadsheet of planned activities. For him it kind of has the opposite effect. His dream weekend is one that is completely empty of obligations where he can work on projects at our house and take the kids on whatever little adventure strikes him in the moment as sounding fun. He loves getting together with the family, but would prefer that the planning took place about an hour before dinnertime with very little fuss or advanced thought. Having never really approached life that way I admit I didn’t think about how it might effect him when he comes home from a hectic day of work and I start rattling off all of the things I have in store for us in the upcoming weeks. But it all came to a head at the beginning of last summer- In the midst of one of my planning frenzies – when he finally politely but firmly let me know that he’d like a little more non-planned time in our lives (yes, still learning things after 13 years of marriage!). So being the planner that I am in order to have non-planned time two weekends a month through the summer I literally wrote on the calendar (with a slightly sinking heart) “do not plan anything this weekend.” But you know what, it turned out to be a beautiful thing! I never once felt like I was missing out on what everyone else was doing. I don’t think I lost any friends because I had to say no to a few social engagements and it really ended up just making the summer feel a whole lot more relaxed, like there was more space to just breathe. Somehow magically it made the warm summer days stretch on and on. Remember when you were a kid and it felt like summer days just lasted forever? It was that kind of magic. Sometimes I feel like nowadays as a culture we really pride ourselves on how busy we are. As if busyness is synonymous with productivity or importance. It’s not that we want to be stressed and crazy exactly, it’s just that it’s almost expected. Think about it. Instead of the standard response to, “how are you doing” being “good” I would say in my experience these days it’s as common to hear a response of “super busy” or “things are crazy!” When is the last time your friend answered you with, “I’m feeling really relaxed and centered and rested!” It would be awesome, but also a little abnormal right? Of course there are going to be times in our lives when things feel busier than at other times. We are real people with real obligations! But I think it’s worth examining which of those obligations are self-imposed. If we know there is going to be a particularly busy time coming up (a move, or baby, or work deadline) are there things that can be said no to in order to be able to say yes to making a little more space to just breathe and rest? It can feel strange to schedule time to do “nothing” but in reality we are doing something really important. Maybe by scheduling less we are really scheduling time to be able to participate in our other obligations better. We can be more present when we are with people and give them more of our attention instead of thinking ahead about the next 5 things we have to do that day. Am I going to stop planning things all together? No way, I love it. And I don’t promise to never tell a friend, “I’m super busy and overwhelmed right now!” What I am going to try to do is to continue planning unplanned time because I want more of that feeling of endless summer days through the whole year, because I want to feel relaxed and centered and rested. Because I want to participate in the activities I do choose more fully. If you want that too I challenge you today to find a day on your calendar to create a little more space for doing less better. P.S. 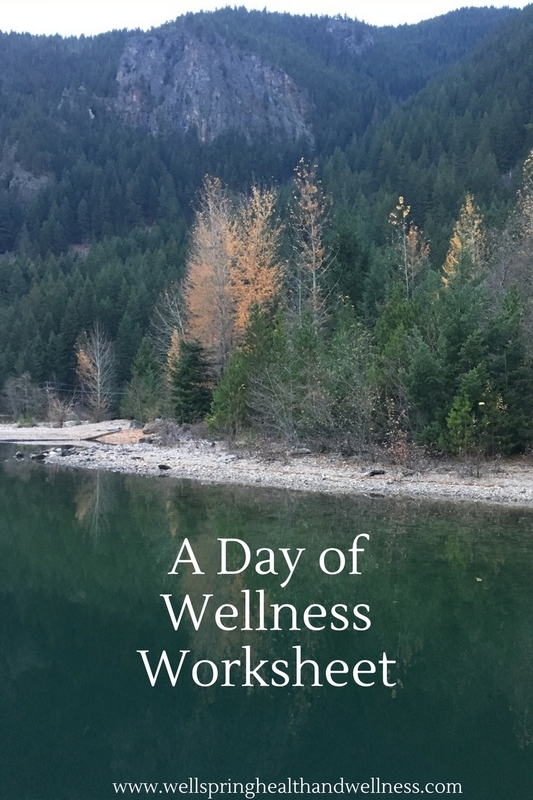 If you want more tips, tricks and inspiration from Wellspring Health and Wellness Coaching sign up here for my monthly newsletter!